The music community in Los Angeles is as diverse as the city's population. You've got your downtrodden singer-songwriters, wannabe pop stars, hipster indie rock bands, too-smart-for-their-own-good MCs – and that's just the beginning. There's a lot of talent in LA, and luckily, there are a lot of venues that will gladly put that talent on display. You don't move to LA and play the Hollywood Bowl the next week, but that doesn't mean you won’t be able to play your music in front of an audience. Here are five venues that Angelenos check out when they want to hear the best local talent. Since 2000, Hotel Cafe has been a singer-songwriter's dream venue. Located in Hollywood, the intimate room (165 capacity) is perfect for solo artists and smaller bands. There are usually four or five acts a night, which means audience members stick around for a while. Hotel Cafe is no stranger to bigger names, either. 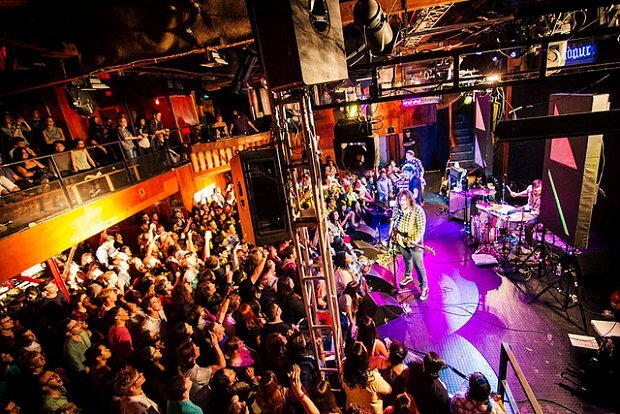 From surprise shows by artists like John Mayer and Chris Martin, to acoustic residencies featuring bands like the All-American Rejects, Hotel Cafe is a place where new artists can share the bill with well-known touring acts. The venue is easily accessible and provides a better experience between the artist and the audience. The Satellite (formerly known as Spaceland) in Silver Lake is a hotspot for indie touring acts, local musicians, and famous comedians. Artists like Beck, Silversun Pickups, and Patrick Park credit the Satellite as being their "home" at the beginning of their careers. The room is big enough to fit a nice-sized crowd, but not too big to feel empty if only a few people show up. The fans at the Satellite aren't casual ones; they're there to listen to the best up-and-coming talent around LA. If you were to upgrade from the Satellite and Hotel Cafe, you'd get the Troubadour. The Troubadour is a West Hollywood staple, as some of the best names in music have graced its stage. But that doesn’t mean locals aren’t allowed to play here. Local acts are added onto touring bills all the time, which could mean 300 or 400 new fans by the end of the night. The room sells out quickly – a testament to the talent that comes through the venue. The fans at shows are passionate about good music, and they display that through appropriate concert etiquette (you know, shut up and enjoy the show). The Echo in Echo Park is a 350-person capacity, local-friendly venue with a mixture of small touring acts and nearby talent. The atmosphere at the Echo is what keeps bringing fans and musicians back time and time again. Everyone is there to have a good time and enjoy great music. The venue reflects the Echo Park neighborhood: a little grungy, but full of character. The bookers don't let just anyone perform at the Echo – they really work hard on finding the best talent to play, and the audiences reap the benefits of their diligent work. The Mint is a historic venue – I mean really historic. Located south of Hollywood in Mid-City, The Mint dates back all the way to 1937 and has supported acts like the Wallflowers, Ben Harper, and Lady Antebellum before they got big. On any given night, you can hear soulful jazz or true country bluegrass pouring out of the Mint's doors. It's a venue that caters to all sorts of musicians and is a favorite among locals. Ryan Pfleiderer helps create music videos for digital distribution. He's a fan of discovering new, up-and-coming talent. He currently works at Maker Studios in Los Angeles.